Seems like the shorter the weeks get to meeting our little girl means the more eventful they become. 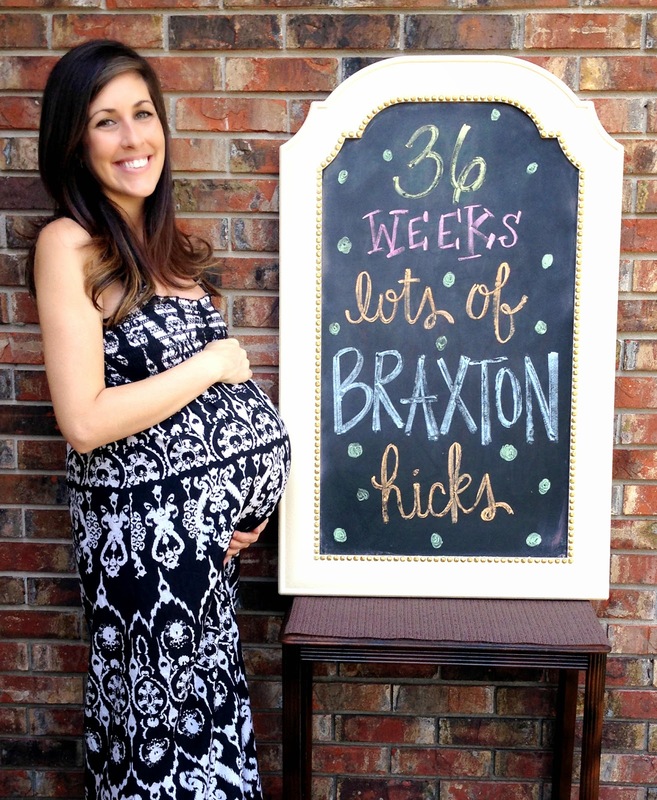 I kicked off 36 weeks with an intense round of Braxton Hicks contractions … not fun. I had only experienced them a handful of times before and they were never painful, but this week they stopped me dead in my tracks. I usually hoard my errands and DIY projects for the weekend when the hubby is home to help … we only got to store #2 before I felt like she was going to fall straight out of my you-know-what! I had been uncomfortable for the past couple of weeks so I didn’t think twice when I felt uncomfortable that day either. We got back to the truck and my husband looked at me with a smirk and said, “My baby’s having contractions!” Leave it to him to have the Ah-hah! moment … how did I not think of that?! Sure enough, a quick call to the Doc confirmed I indeed was in the midst of intense Braxton Hicks and I landed myself two days of bed rest before my scheduled appointment. Bed rest is the pits. As if the Braxton Hicks weren’t enough, being confined to the couch or bed only reminds you of everything you don’t have ready for baby. There’s no sobering moment quite like realizing the fact that you could go into labor at any point in the next few weeks. A mini panic attack and I suppose some actual rest later, we met with the Doctor for our appointment and everything was well in Babyland. I ended up with painful Braxton Hicks because Mykenzi was trying to tell me to take it easy. Bed rest was lifted as long as I learn to listen to my body and rest when I feel uncomfortable. #easiersaidthandone This appointment was also my first cervix check which was more unpleasant than I ever thought possible and revealed no signs of being dilated. I’m super excited to get to next week’s appointment because we will get to see our baby girl one last time before we meet her face to face! The Doc wants to get a weight check on her and confirm that she is head down and prepared for arrival. I haven’t seen the little lady since 20 weeks so I’m super anxious to see how much she has grown. In blogging news, last week’s negativity only brought a plethora of positivity for Baking Baby Brown. This blog has taken on a life of its own. It was something that I started simply to remember my adventure in pregnancy and share with my daughter when she’s older … little did I know that I would end up connecting with other bloggers on the same whirlwind of a journey. It’s been a blessing to share our hopes, our fears, and our honest thoughts on pregnancy while bonding together and offering each other support, advice, and words of encouragement along the way. As if connecting with readers across the country wasn’t enough, my local following has made me realize that this blog is much more than just a baby project. I’ve decided to take this blog to the next level and continue blogging post delivery. I still have quite a bit of learning to do about the blogging world, but hope to continue to keep your interest and provide you with fun reads in the future. Thank you all for continuing to read my blog each week, it’s been a really fun experience sharing this journey with you. Total weight gain? Standing firm at 28lbs … I thought for sure I would’ve gained a couple of pounds this week. Maternity clothes? Anything that covers this belly. Stretch marks? Miraculously, not yet! Sleep? Sleep has been decent this week. I’ve been extremely tired so I’ve been getting a lot of naps in and finally found a pillow stuffing combination that supports this wide load enough to be semi-comfortable. PEAK of the week? Checking things off the baby prep list! Such an accomplished feeling. PIT of the week? Bed rest! It’s so hard to play by bed rest’s rules. It drove me nuts! Miss anything? Hot Dogs … National Hot Dog day was this week and it was a painful reminder that I’ve been missing them ALL summer! Movement? Yes. She’s definitely gotten bigger so the movements are intense … I constantly have a little foot poking out my right side. Food cravings? Everything food related. Icee’s have been really big lately because its so hot and well, its an icee they are amazing even when you aren’t pregnant. Anything making you feel sick or queasy? Getting too full. Space is limited so if I get to full I feel like I’m going to burst. So uncomfortable. Gender? If she’s still not a girl at this point we’re in trouble. Symptoms? Braxton Hicks … painful ones at that! Still some swelling and I’ve notice a little bit of heartburn again this week. Belly button in or out? Still flat. I wonder if its ever gonna pop? Happy or moody? Fairly happy … I might have been a tad moody while on bed rest. More anxious than anything else … its so close! Milestones? Bags are packed and car seat is installed … we are ready to bring a baby home! Looking forward to? Finishing the nursery! I WILL get it done before she gets here! I am so excited for you! It is getting so close! When the sleepless nights hit and you're at wits end, (or if you're on bed rest) remember, this too shall pass, so cherish it while you can. It is easy to get caught up in the difficulty of the moment and forget to enjoy the details. I can't wait to see how beautiful she is!!! Bed rest really is the worst!!! I remember Guady had to get onto me when I got put on it back in 2006 pregnant with Guady Jr… I was on it for a month and it was SOOOO nerve wracking!!! I remember sitting at the dining room table with the George Foreman to "cook" dinner b/c I felt useless!!! So glad you're going to continue blogging – you've got a knack for it my dear! I also think you should blog hair, makeup, and fashion tutorials since you always look impeccable! Love ya sweetie!